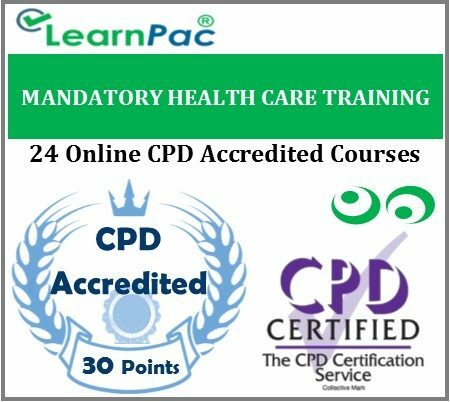 Welcome to LearnPac Systems’ online mandatory health care training course package. These online CPD training courses were developed to meet the required learning outcomes which were recommended by the Care Quality Commission (CQC) and the Skills for Health’s UK Core Skills Training Framework (CSTF). How am I assessed and certified for these mandatory training courses? At the end of each of the individual mandatory training module, learners will be required to complete an online assessment. On successful completion of the knowledge test (80% pass mark), learners will be able to download a FREE CPD certificate that is valid for one year. After adding your preferred e learning statutory & mandatory training course (s) to the shopping cart (by selecting Add to Cart), you will be able to make a secure payment using all major credit and debit cards. You can also make a secure payment through PayPal. Once you have purchased your mandatory training online training course (s), you will be sent a confirmation e-mail. You will then receive a link and login details to access your e-learning course (s) within 24 hours of purchase. These online training courses cover the main points relating to mandatory training which are in line with the CSTF and CQC recommendations. They have additional online learning resources that provide more details for learners to refer to during the course and in practice. What are the main aims of this online mandatory training package? Give support to both social care and healthcare staff that will help them work efficiently and effectively in order to deliver all services in accordance with their own responsibilities. To provide recommendations that are both relevant and evidence based. *Each of the 24 mandatory training modules provides essential and adequate detail as suggested by UK regulators. What are the objectives of this mandatory training package? Provide a regularly updated knowledge assessment that will generate a FREE CPD certificate. A FREE blended learning environment that can be used by both individual learners and organisations. What is covered in this Mandatory Healthcare training package? Who is this Mandatory Health Care online training package for? These courses are also relevant for health and social care charities, nursing and residential home staff. Why is Skills for Health aligned mandatory training important? 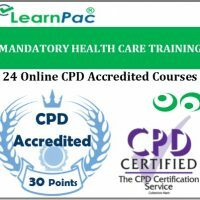 This Skills for Health aligned practical mandatory training day and eLearning courses are designed for health and social care workers who work in NHS hospitals, private hospitals and related settings. This includes nurses, doctors, allied health professionals and health and social care support workers, as well as locum doctors, agency nurses, support workers and healthcare assistants. The Skills for Health UK Core Skills Training Framework recommends that health and social care workers who do not have client facing roles may be required to only take some of these statutory and mandatory courses. Please check with your employer which courses you require. LearnPac Systems will not be responsible if you take the wrong courses. You will be provided with the optional statutory and mandatory training courses that are required for your area of work. You can however choose the mandatory training modules that are most suited to your specific clinical environment. 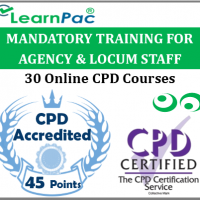 If you are a locum doctor, agency worker or agency nurse, please check with your locum agency regarding the specific mandatory training modules you require to meet the compliance requirements. This online mandatory training package has been designed for busy healthcare and social care professionals. It has additional online learning resources that provide more details for learners to refer to during the course and in practice. For those who have completed statutory and mandatory training before, this training package provides you with the key legal and professional issues as specified in the Skills for Health’s UK Core Skills Training Framework (CSTF). This mandatory and statutory classroom and e-learning course package was developed to meet the required learning outcomes in the Skills for Health’s UK Core Skills Training Framework (CSTF), the Health and Safety Executive (HSE) and the Care Quality Commission (CQC) recommendations for health and social care providers. This package covers all the legislative and medico-legal/clinic-legal requirements for health and social care professionals to work safely and efficiently, as well as minimising litigation. 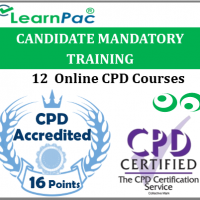 LearnPac Systems’ CSTF aligned practical and online mandatory training courses help UK employers and employees alike to fulfil their legislative obligations. Our mandatory and statutory courses for doctors provide the essential knowledge and understanding as required by regulatory authorities. Our Skills for Health aligned mandatory training courses can be taken as part of induction to healthcare and social care sectors, as well as statutory and mandatory refresher training, annual mandatory training updates or continuing professional development (CPD) requirements for health and social care professionals. LearnPac Systems’ online courses range from introductory modules at Level 1 to advanced and expert modules up to Level 6. Our e-learning modules count towards CPD hours for professionals in various sectors to meet mandatory and statutory requirements.